User – How do I create a multi-day task? 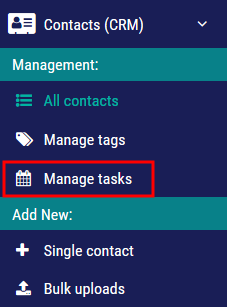 Step 2: Click on Manage Tasks just below. Step 3: Click on a day on the calendar that you wish to schedule your task (or the first day of a multi-day task). Step 4: On the pop-up, you may edit the time for this task by clicking on the clock icon. Click on Click here to schedule a multi-day task to put an end date and time. Step 5: Click on the calendar to choose the end date. Once the date is selected, you may edit the end time in the form field. Step 6: Choose a task type in the drop down then describe your task in the Task field. 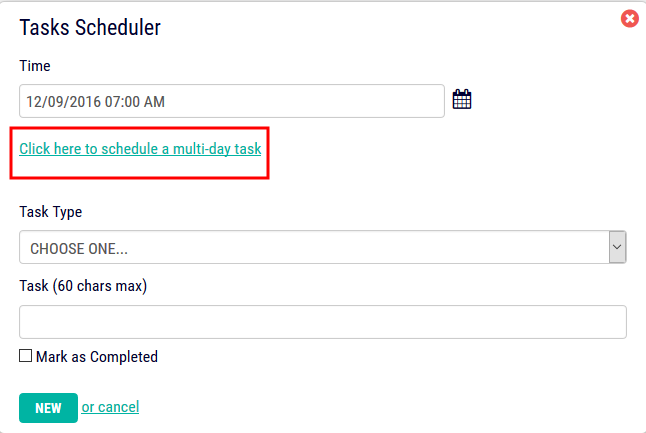 Step 7: Click NEW to save the task or multi-day task.